Murder by Gaslight: Murder by Little Girls. What wickedness in the heart of a child...what evil. I could find no further information on this incident after researching fairly intensively. No Bessie/Carrie/James Waterman on Find A Grave (buried in Kansas that would fit the time frame and location for the individuals). 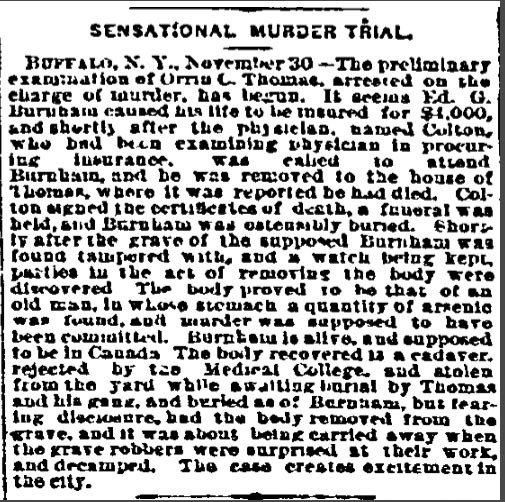 There appear to be "Waterman" that still live in the vicinity of Ottawa, one in police work there, but whether they are descendants of James Waterman cannot be verified. Truly a horrendous account of the evil and brutality that children can inflict upon even smaller children. A true tragedy. CD in North Carolina. 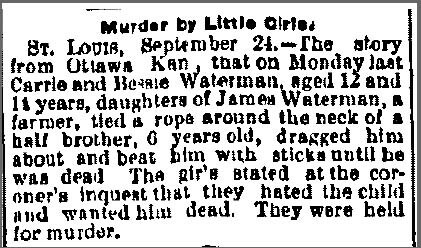 According to newspaper reports from Ottawa, Kansas, at the time of the murders the girls were 12 & 14 years old. When reading 19th century newspapers, don't expect two versions of the same story to agree on facts. Carrie and Bessie Waterman listed as daughters of James Waterman and Almeda Waterman of Peoria, Franklin County, Kansas in 1880, per ancestry.com. 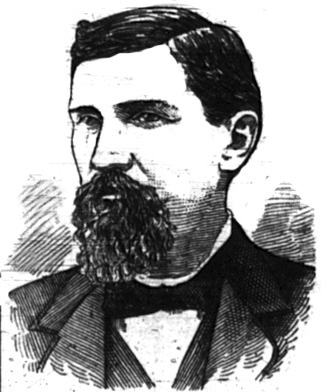 Looks like half brother's name was James F. Waterman. https://www.findagrave.com/memorial/44952735 Headstone of Almeda Tracy Waterman, wife of James, looks like mother of James F (the step-brother) and step-mother of Bessie & Carrie. Died in December 1880, maybe 2nd wife of the elder James? This would have left James jr without a mother/protector at the time of his death. Below the article about the two girls, it says James Waterman was indited for the murder of his own son.